Bioluminescent Bay (aka Mosquito Bay or Puerto Mosquito) is one of Puerto Rico’s three bioluminescent bays, located on the island of Vieques. A popular destination for nighttime boat tours, this bay is by far the brightest. The water is illuminated by dinoflagellates called Pyrodinium bahamense, tiny microorganisms that glow when touched. Any contact with the water—by the boat, a paddle, or a part of the body—makes the water glow bright neon blue and green. Jump in for a neon-lit swim, cruise over the water in a pontoon boat, or board a kayak to paddle through the bay. Nighttime kayak tours typically allow you to learn about the biology of dinoflagellates and their interaction with the Vieques ecosystem. Nighttime tours require a stay overnight on Vieques Island; the tour company can typically provide recommendations for hotels or guest houses. Be sure to apply bug repellent, as Mosquito Bay lives up to its name. Mosquito Bay is the only bioluminescent bay in Puerto Rico where swimming is permitted. Mosquito Bay is located on the southern shore of Vieques, which can be reached by ferry from Fajardo on the main island of Puerto Rico. Reaching the bay is an adventure in itself that requires a 10-minute drive down a very bumpy and rutted 4WD track. Tours typically provide transportation to the bay from the town of Esperanza on Vieques Island. The dinoflagellates in Bioluminescent Bay are active year-round but are best seen during the new moon, when the sky is darkest and the water glows brighter by comparison. Tours typically do not operate the day before, during, and after the full moon, when the organisms are difficult to see. Isla Vieques was under the control of the US Navy for 60 years and thus remains largely undeveloped. The small island is home to unspoiled rain forest dotted with pristine beaches and archaeological sites including the Hombre de Puerto Ferro, where skeletal remains up to 4,000 years old were discovered. Along with the famous bio bay, Vieques is host to some excellent snorkeling, especially at Blue Beach (Bahía de la Chiva). 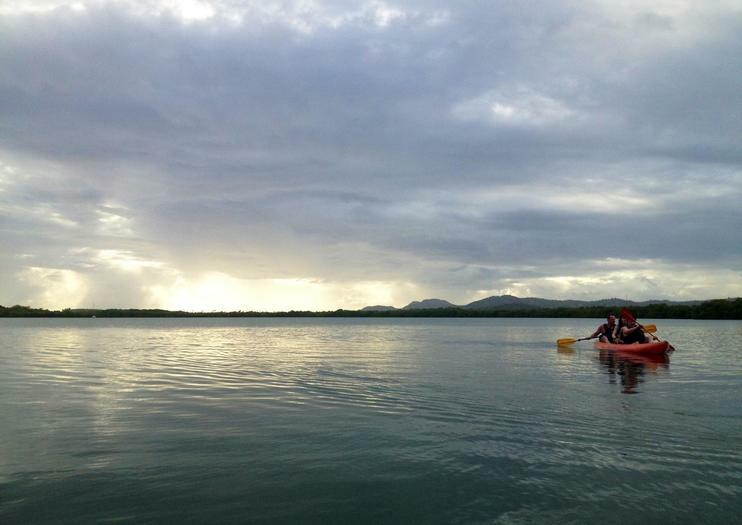 Paddle through the waters of the BioBay, a luminescent bay outside of Vieques, on this nighttime kayaking tour. With provided kayaking equipment and instruction, simply follow your guide through the florescent waters and and learn about this natural phenomenon. Choose between an early or late evening tour; note that you must stay overnight on Vieques Island (not included).